Since we moved to our new (temporary) office space in the U District, I have been walking to and/or from work most days. A couple of days a week I even run in. It's so nice to spend the hour walking rather than 45 minutes driving. Of course, it's summer now... we'll see how I feel when the rains come in November! Anyway, today while walking home I had two very different, and unexpected exchanges. 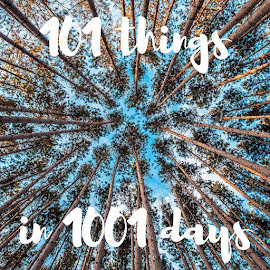 #1 - While walking up a hill in a not particularly busy area, I noticed a small group of young men walking toward me. Guy: Cool. Umm, hey, are you, umm, walking for the HEALTH? Me: (surprised) Oh! No... just walking home from work. Guy: Well, all I can say is, well, you look GOOD. WOULD YOU NOTICE ME IF I PUT MY #*CK IN YOU EAR?!?! Exchange #1, unexpectedly nice. Exchange #2, unexpectedly weird. I did wonder if maybe he was wearing an earpiece and was talking to someone else... Who knows. Very odd. That's the magic of the walking commute. Sometimes things are delightful, sometimes things are weird. 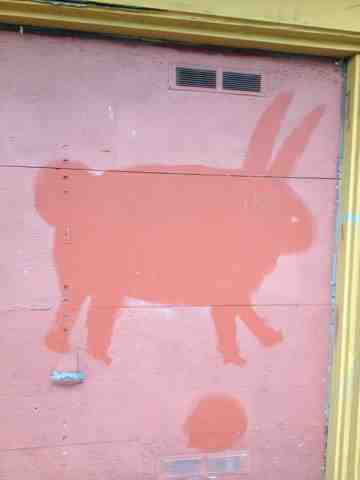 And sometimes you see a pink bunny painted on a garage door. Even though the second guy was rude, it made for an interesting blog post. Seriously though, it sounds like the dude has issues. 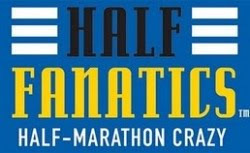 100 days till the Wine and Dine Half Marathon! !